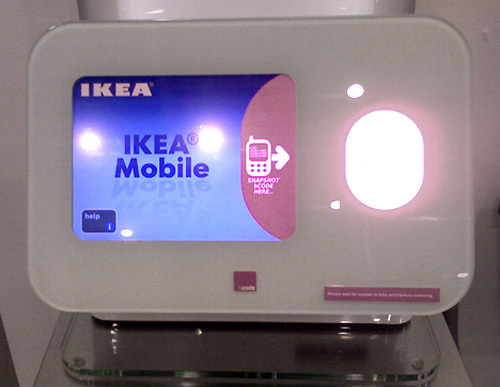 IKEA Mobile Kiosks Showing Up In Stores (Probably Some Assembly Required) | OhGizmo! One of the writers at Apartment Therapy Unplugged came across this kiosk at their local IKEA in Seattle that allows you to sync your mobile phone through text messages or by scanning barcodes. While the system won’t make your adventures through their flat-packed wonderland any less annoying, it will give you access to coupons and information on their weekly specials. And when you leave the store you’ll still get regular updates as to what’s new or what’s on sale. I’m just glad IKEA isn’t replacing their handwritten shopping list system, because otherwise I’d be forced to hang out at the local golf course in order to restock my miniature pencil collection. Nice find, I'm wondering if anyone is really going to use this new ikea mobile stuff. But I'll be sure to test it out if i visit an ikea store equipped with this tool. So far they are only available in ikea usa locations btw. International ikea stores do not have these things yet.